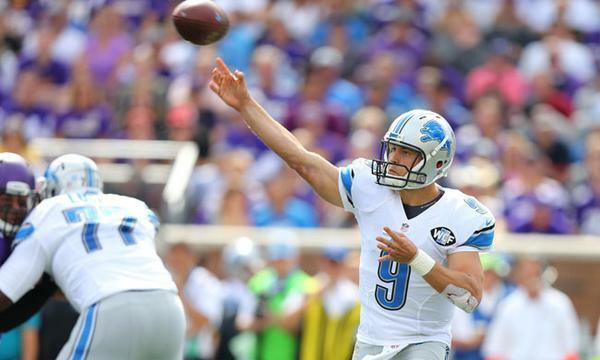 Call stands, #Vikings ' lead cut to 17-10 pending PAT after Calvin Johnson's first score of season. 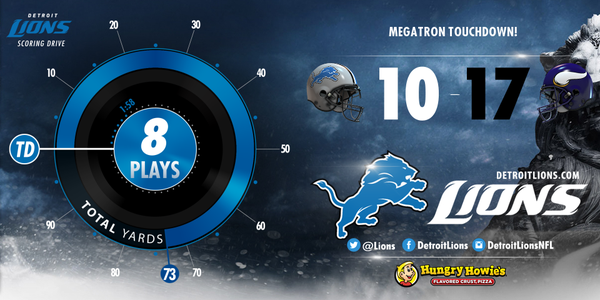 Hurry up worked for San Francisco a few times vs. #Vikings , and #Lions just went 73 yards in 1:58 on that scoring drive. Halftime in Minnesota. #Lions will get the ball to start the 3rd.
.@teddyb_h2o halftime stats: 6/8 for 90 yards and 1 TD (151.0 passer rating), 2 rushes for 9 yards and 1 TD.
.@AdrianPeterson halftime stats: 16 carries for 70 yards and 1 catch for 49 yards. Continued good news for the Vikings is that I'm guessing you're not hearing Matt Kalil's name called much and he's got Ansah today. Offense will have to carry the day for vikes. What happened to the D this year? 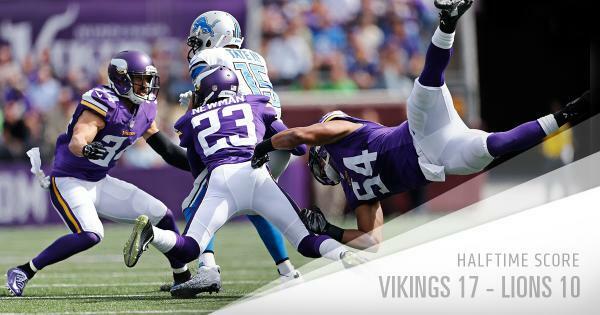 What a play by Captain Munnerlyn to wrestle the ball out. Sendejo recovers and #Vikings are set up 1st-goal to start second half.
.@captain_41 forces a fumble and @Asendejo returns it to the DET 6-yard line! Nice play by Munnerlyn but it looked as if Moore was down when he lost that ball. The #Vikings takeaway is under review.
.@captain_41 forces his 5th career fumble and @Asendejo recovers and returns it to the Lions 6 yard line. It is Sendejo's 1st career FR. The ruling on the field stands and the #Vikings will have the ball at the DET 6-yard line. Just like I said, that play was impossible to overturn. 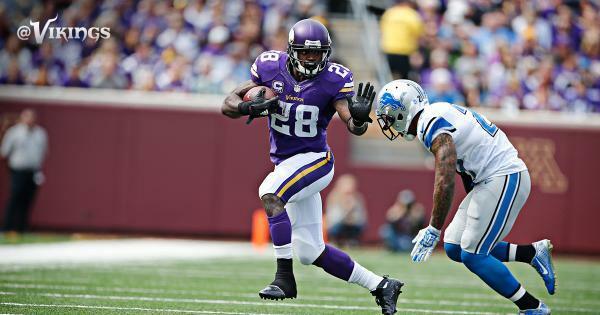 Then Peterson gives it right back, first fumble of season comes on his 17th carry of the day.
.@AdrianPeterson follows on the first play of the drive and DET recovers at the 11-yard line. Two pass deflections and that TFL for Brian Robison, who has hit the fountain of youth today.
.@Brian_Robison with 4 tackles, 1 TFL and 2 PBUs today. Marcus Sherels with a big punt return! Marcus Sherels with a 31-yard punt return to the Lions 34. @teddyb_h2o follows with a 12-yard completion to @Wallace17_daKid . 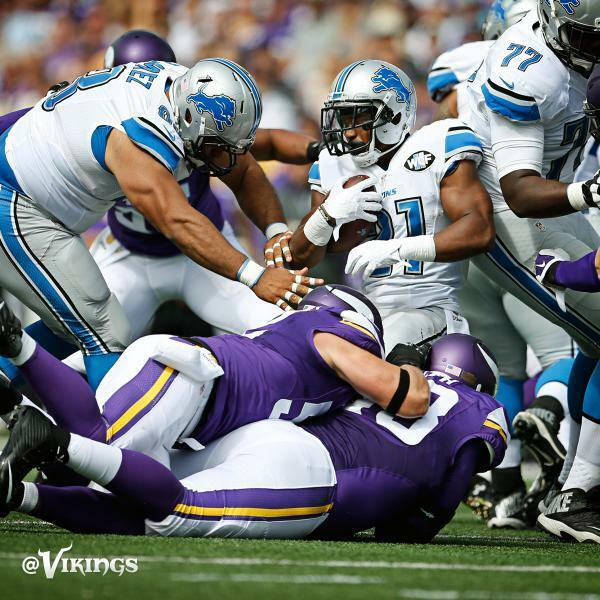 @teddyb_h2o scrambles for a #Vikings 1st down at the DET 1-yard line!
. @teddyb_h2o with a 1st down run to the Lions 1 yard line. 1st and goal #Vikings .